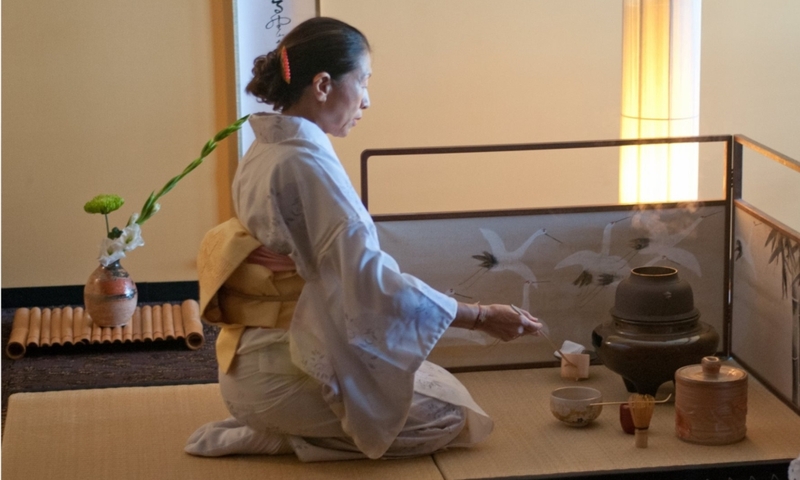 I recently attended a Japanese Tea Ceremony conducted by my dear friend and owner of Harumi Healing House Yoga Studio, Harumi Maejima. As I sat on my yoga mat and observed this very special event, I realized how comforting, how very relaxing and peaceful rituals can be. Why was this, I thought? What is it about connecting to very old, ancient traditions that made my current day life feel so good. What is it about practicing something regularly that calms and comforts me and brings me peace? And how might this help me on my self care journey? Psychiatrist and author Dr. Abigail Brenner has some insights into this. I observed Harumi as she very carefully performed the ceremony by handling the chakin (hemp cloth), chasen (whisk), chashaku (tea scoop) and other important utensils with deliberate and expert motions. It reminded me of the preparations for Communion in the Catholic Mass. I was immediately transported to my youth attending mass weekly with my family. Even when we spoke only Latin during Mass, as a child, I could sense the importance of the ceremony and enjoyed the sacred space I was sharing with my parents and siblings. Even back then I felt the peace. Why do I say “Grace” before my evening meal, or walk my labyrinth each morning, or even light candles, turn on soft music and dim the lights before a bubble bath? All these rituals help me feel some sense of control in this crazy and chaotic world. They help me find peace. In the Japanese Tea Ceremony, Harumi showed so much respect for each aspect of the ritual – from making the tea to cleaning up afterwards. I was overwhelmed with gratitude for my personally brewed cup of tea and the comfort and peace it brought to me. Dr. Brenner gives more reasons rituals make us feel good. Rituals connect us with nature and the seasons and remind us of the interconnectedness of all of life. Rituals awaken that which is eternal within us and show us how our individual lives are part of a much grander design. Rituals provide us with a sense of renewal and help us to reevaluate our journey thus far and to reaffirm that the path we are traveling is the right one for us. Rituals provide an ongoing way to structure our lives and engender a sense of healing calm and a feeling of trust in life’s flow and forward movement. Rituals give us a way to connect to family, past and present and enable us to access, honor, and strengthen our own identity. 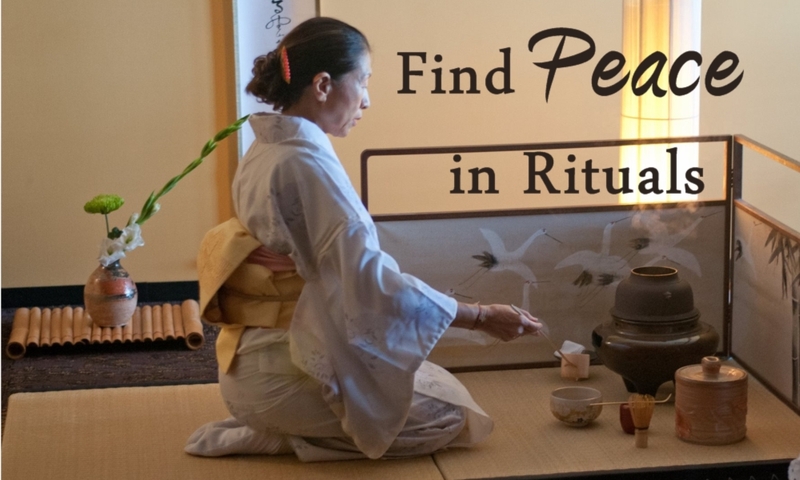 Rituals remove us from the ordinary flow of life and place us in sacred space. Rituals help us access our authentic selves through their ability to carry us into deeper levels of consciousness. Rituals are more tools for our self care journeys. I’d love to hear examples of rituals you celebrate and how they bring peace to your world. I find the predictability of ritual calming. Since April I’ve been meditating in bed every single morning as a way to start my day and to connect with you and Dom. Starting each day with the ritual of meditation gives me a focus for my day. Thank you, Joni! So glad you have found the ritual of meditation to be so rewarding. I love seeing your name come up on the Insight Timer app every morning. Thanks for stopping by.